My free workshop, Use Your Words, was sparked by the endless creativity I found when creating with an alphabet stencil. Once I had that in my hands, my mind went crazy with the possibilities. I love using text when I create. It’s even better to make my own words — the exact words I want and when I want them! And I want to share all I’ve learned with you! Look over my shoulder as I create using these letter diecuts in this free 2 week workshop. You can use any words, any letter stencils- these just happened to be the ones I had. 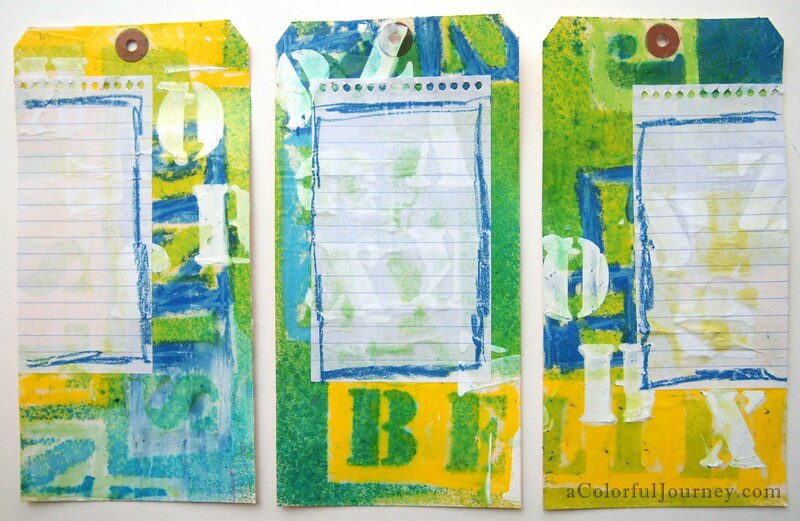 The letters make amazing backgrounds, incredible embellishments, bold titles in an art journal, and more! 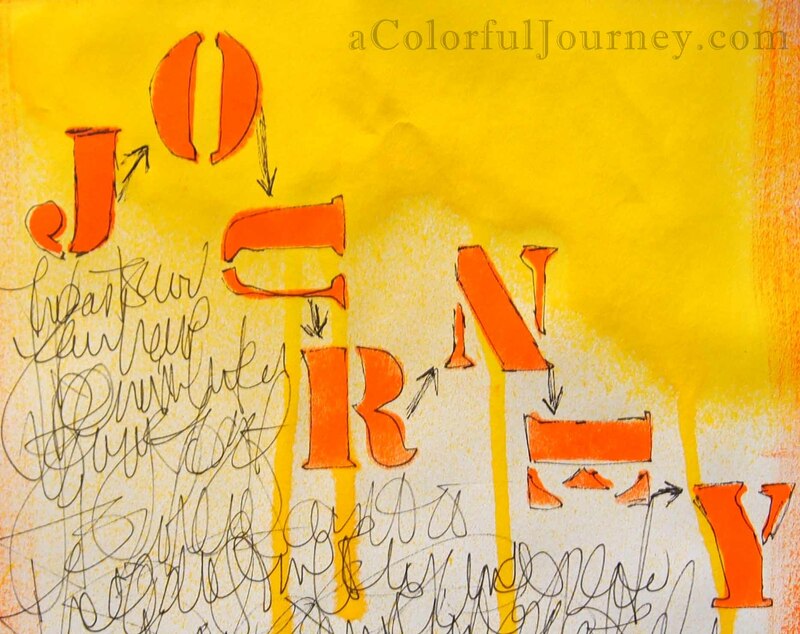 I’ll share with you my whats, whys and hows, such as: what supplies to combine to get color on the page; why I make the choices I make about placement, colors, and so much more. Learn to play with your words and supplies with confidence! Both those new to mixed media and veterans alike will enjoy my tips and tricks for how I use my supplies such as oil pastels, watercolor crayons, Stabilo pencils, spray inks, and gesso with the letters and words. Once you’ve registered for this free workshop you will receive an email within 24 hours that will give you the links to the workshop and your password. The supply list is there but I encourage you to use what you have first! This workshop is now closed but there is a new free workshop in development. Want to play in my next free workshop? I’ll be letting people know when it is open through my newsletter. Get signed up for my newsletter and know as soon as the new free workshop is ready! Already signed up? You’ve got forever access and you can find the workshop here. Already registered? You can find the workshop here. Hi Carolyn! Just wanted to say I’m excited to start this class, and thank you!!.. But have just a quick question. My first email back to me while registering, had a .VCF attachment??? at the top left of my email? Am I supposed to open this, or what is it? I’ll watch for the link and password, and thanks again! Have a great weekend! I have no idea what a vcf attachment is…you shouldn’t have to open anything. You will get an email that is bright yellow and has the class links and password in it. If you don’t see it within 24 hours of registering, let me know. Turns out the .vcf is put on my by Mail Chimp. It has nothing to do with the workshop, so no need to download it. I am so excited for this workshop! Thank you for offering it and sharing your amazing creativity with us! Thank you so much for your generosity in offering this free class Carolyn! I can’t wait! Thank you very much for the workshop, Carolyn!!!! I’m really looking forward to it … and hoping I can stay caught up!!! I also had that same attachment box. Looking forward to your class! I like your use of bright colors and your theme of using our words is exactly my personal goal for the year! Sounds like a perfect excursion! Yippee! Looking forward to this workshop. Thank you so much for providing it. This is a first for me and after viewing the short intro and getting to know just a little about your personality, I think it’s going to be a great 2 weeks! VCF is an automatic signature or “electronic business card” that some e-mail programs automatically attach to messages. You can just delete them. 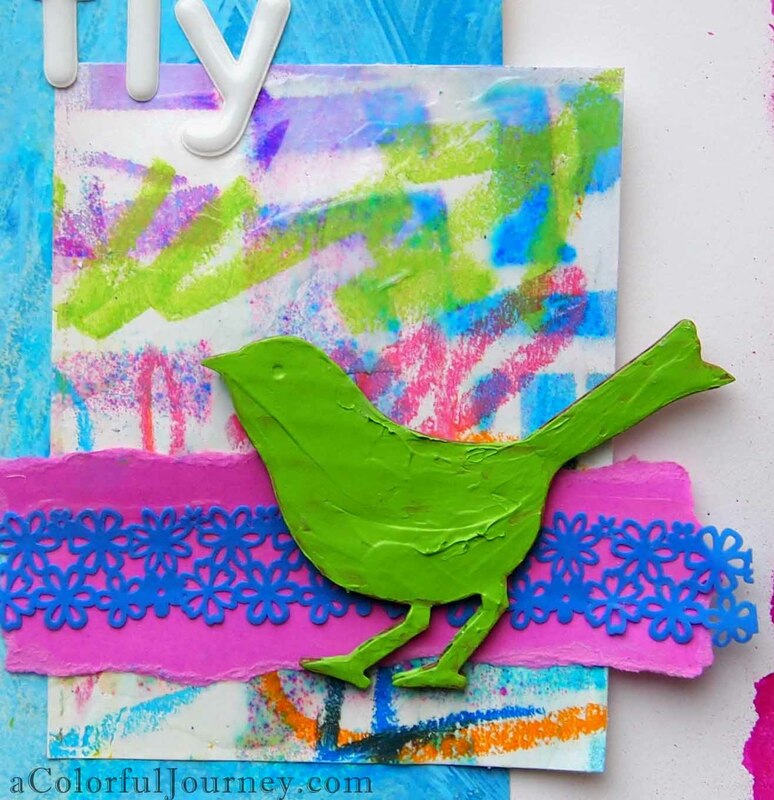 I’ve been enjoying your gelli party Carolyn, and looking forward to this workshop. Thank you for making this workshop, Carolyn. I know I am going to love it as I am a word and lettering freak! Elaine in the sunny and windy south of France. Thank you so much for doing a FREE workshop! I look forward to learning new things about using lettering. Thank you Carolyn! It’s so sweet of you to provide this free workshop…one that I can afford…LOL. Can’t wait for it to start. Hi Carolyn! THANK YOU for the awesome workshop ! I am trying to get on to see the supply list and the pass word isnt working for me Should the list be there yet? I am excited for class to begin, and grateful to you for offering this workshop for free! Found you through Marjie Kemper, and I just signed up. Thanks so much! I’m just beginning to explore art journaling and mixed media, so I’m excited! Hi Carolyn! I’ve just discovered you and I have been having so much fun. Was so tickled to see that you are having a workshop ( and love the price – tee hee) I am always wanting to learn new ways to use my art journals and I love words…….. so this should be alot of fun!!!! Thank you so much….. i have signed up, received my password – but I can’t get in to get my supply list…..Help!!!!!!!!!!!!! I also tried to get to the supply list, but it won’t take the password. Are you using an iPad? The capital letters are tricky on those- and the capital letters matter. There are no spaces in the password. That is the hardest part for me, because I automatically leave spaces between the words. Pinned this site to my board under Tutorials. My pinterest is Twocooltexans. Thank you so much for doing this and for doing it as ‘free’! I left my dream job in December because the commute was costing more than I was earning and have not found a job locally…yet…so I have to watch my pennies. Thank you so much. Thank you for sharing your amazing creativity with us! Can’t wait to get started. So appreciate your kind generosity, Carolyn! Have signed up and a looking forward to the class and (possibly) meeting others! I chose a word for 2013 to.focus on and it is ENERGY. Looking forward to your class. I had been staring at my gelli plate unable to make the leap. I am so looking forward to this, thank you for sharing it with all of us! Thank you Carolyn! It’s very sweet of you to provide this great free workshop…one that I can afford and that i really could use…just started my first artjournal…and words…hard.. Can’t wait for it to start i am really looking forward. I’m looking forward to this! 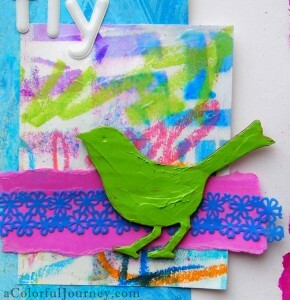 Love the Gelli, so the workshop is going to be fun! Thank you. where do we share our art? We have a Flickr group at http://www.flickr.com/groups/useyourwordsworkshop/. Can’t wait to see what you create! I’m signed up for the class, have confirmation, but am coming up with error codes when I try to access the Workshop page. I just found you and this workshop thru Jessica Sporn’s blog, Thanks so much for the workshop. Looking forward it! thank you Carolyn and i am so pleased to have crossed your path on this journey into creativity. I can’t believe how lucky I feel to have “discovered” you on YouTube, and now being able to be in your Use Your Words class! The only problem is that I just had surgery 3 weeks ago on my right wrist, so that limits me very much as to what I can do, since I am being forced to use my non-dominant left hand! In any case though, I am going to do what I can, even if it just means just watching the videos for the time being, lol! Thank you so much for offering this class for free, your generosity is amazing! PS: I read that you were an elementary Ed teacher in your previous life, what grade did you teach? I am guessing it was with the little guys, just by listening to and watching you, Am I guessing correctly, or am I way off base?, tee hee! I ask because I am a kindergarten teacher by profession, I am current,y not working due to health reasons. Anyway, I can sense another Kindervfrom a mile away! Kindergarten? I am honored that you would think that of me. Kindergarten teachers are the most patient teachers ever! I did 2nd and 4th. How cool to be using your non-dominant hand- (but hope it heals quickly for you) that has got to be so freeing since there is no way to make it “perfect”! Can you tell I am a recovering perfectionist? I don’t know what happened but I can’t find the videos and my art page is gone from Flicker, it’s as if I was never there! Is anyone else having this problem? I sent you an email with the new links- there was a huge issue on my site early in the week and the links had to be renamed. I sent out an email that afternoon with the new ones but that added such unwanted confusion- sorry for the hassle here. No idea about Flickr- it would not have been impacted by my site issues. Thank you Carolyn! I got the email! I am really awed by the ability of the participants to take a video lesson and run with it, all putting their own spin on it. I’m still so new to this that I have to “think out” what words I’m going to use and then how I’m going to get to the finished product. I have a friend who is just flat out fantastic with this sort of thing. She is teaching me so much and directs me towards so many different Mixed Media artist that I’m spending way too much time on the computer. It’s all fun though, but I need to force myself to get other things done. Thanks so much for the first week worth of lessons, I’m looking forward to next week. I received the first two videos (about the letter stencil and your first journal page). If you are posting on Monday and Wednesday, then aren’t there videos that I’m missing? Loving this and want to catch up so please help. Thank you, thank you. You should be charging! Love your blog & videos….I have the supply list video, and the letter stencil video..was there more after that? not sure why but i haven’t had more emails about others. Thank you! All the videos can be found by going to the very top of any page in the workshop and mousing over Use Your Words. When you do that all the lessons will appear in a drop down menu so you can click on any of them. Thank you Carolyn for what has been a very enjoyable and informative class. Your generosity in sharing is appreciated. Thanx CAROLYN, This was a lot of fun. I enjoyed your thoughtful and careful instruction. I look forward to the next opportunity. Thank you for offering this free class, I think this is just what I need to get me back to expressing with paint and paper look forward to getting started if its still available! I came across your workshop through the work of another flickr member who had added one of my images as a favourite Im so glad I had a peek at what she did it led me here ! Hi Carolyn-I haven’t received any log in information for this class, yet. Thanks!! Thanks so much Carolyn for this free workshop you offer. I’ve just signed in and am very curious what is awaiting me. My first workshop ever, whoohooo! Welcome! Lots of fun awaits you! Thanks for free class. Am anxious to get started. Looks like fun. Thanks Darlene! Really appreciate it! 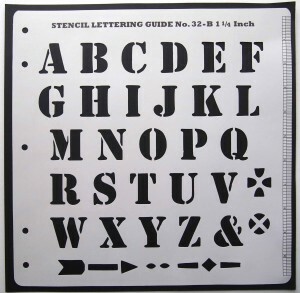 CAN NOT FIND JENNY BOWLIN STENCIL LETTERING GUIDE ANYWHERE! ANY SUGGESTIONS? They have been sold out but you can use any letter stencil. There are some at Staples and sometimes at Wal Mart too. Some people have cut their own with a Cricut or Silhouette. Others have hand cut some. I have registered for this in the past, but cannot now find the password, please can you let me have it again? Many thanks, carol. Hi Carolyn, thanks so much for your generosity in sharing your knowledge. I signed up and looking forward to learning more techniques from you. You are the best!! grow together, it is never okay to intentionally hurt them. I would like to look at your “Use Your Words Free Class but I don’t see where to sign up, can someone direct me? There are 2 links in this post that if you click on those it will take you to the sign up form. This was my first class with Carolyn; it will not be my last! I enjoy her casual approach to PLAYING with art materials. Thank you, Carolyn, for making this so much fun and for offering it at no cost. Do guess whaat happens to convey after they question why they should love your business. Doritos Crash Course is something genuinely human obstacle courses, only simplified down, along with no respect on the laws of physics. are not able to regain anymore Gamerscore popints throughout the use of their Xbox Live accounts. Incredible that you would be so generous and offer these great classes at no cost. I just signed up for Use Your Words and anxiously await the email. Thank you thank you thank you! I’ll help spread the word… And will shop dickblick using your site link when I purchase more supplies. Thanks Renee – if you don’t see the email within the next half hour, let me know. I like to keep an eye on those elves that run the computers. Gosh – I am so embarrassed to say that I cannot find the email with my password. I generally save them in a folder but can’t find it any where. How can I reset my password? I apologize for having to ask you. Also, I’m placing an order from DickBlick this Sunday. If i just use the link to DickBlick from your website will you get credit? Hats off. your blog page was a very great browsing experience and nicely planned out. I can’t seem to get the workshop UseYourWords though I have registered with everything Carolyn Dube does. Help, please? Hey Carolyn, I signed up for the class last year and love it. Thanks for offering it. I wanted to look at it again but my password doesn’t work anymore. Did it change for the new year? Help please. Hey, me again. Ignore last post. I was using the wrong password. Yes I am an idiot. Hi Jan, it’s called a catalyst blade tool. Hope that helps! Soon there will be a whole new free workshop in its place. I’m working hard to get it up and ready for you and I’ll let you know in the newsletter as soon as it’s ready!